starts off as an island map then turns into a ground map later with a huge middle (deserts tend to be very open) and the only other gas expos are on the other side so if the game isnt fast, the right side will see some use. plays well from what i have seen. tank gaps wont really matter as it is island in a way . 1. a rush in a map with 122-min blocks at both bases is non-existant. 2. That amount of spread minerals at the 9 'expo' will surely annoy players. I don't think that's a very good idea to begin with. 3. Gas issue. Even if they're both 'bad', it's usually better to let them both begin on a 'good' position. 4. 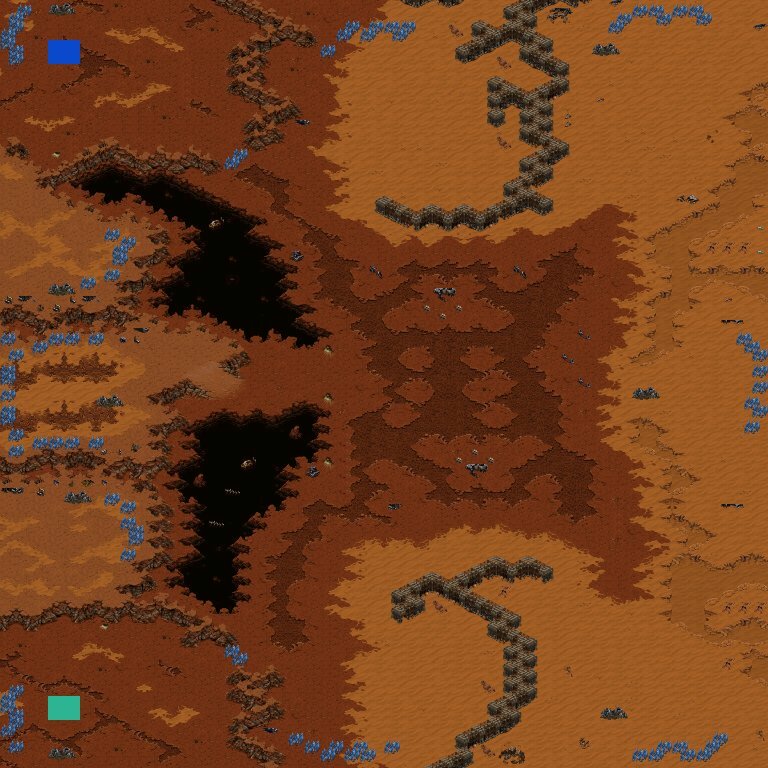 Zerg will hate you for this map. The nat is an island expo, and the first natural on ground is a min-only which doesn't even block his choke. Try to give Zerg a chance as well. 5. No mineral block on the islands. Terran can simply build a CC next to it and liftoff there, giving it an even bigger advantage over the other races than it already has on (semi)-island maps. its an island map what does choke blocking have anything to do with this ? cant fix gas issue. but you did bring one thing to my attention. top gas can be tanked bottom cant. i have to make top base have top gas. a rush is existant ive done it. put 3 miners on it and it will go away faster then you think. 4. ill add mineral block. well inept, those 3 worker are missing in your eco then which damages your mineral gaining heavily. when doing a rush, you have minor economy anyway, giving another 3 probes away is no option. i kinda wanted people to built outside 1 base makes it more realistic, and gives an edge to faster players as they should have. pumping from 3 bases requires more skills then 1 base because your buildings are spread out. thats why i left the rest of the map very open, and the mainbases very small because you do not need a lot of buildings early on an island map. K... I just updated it so it would show a desert icon instead of the broken link icon... did you re-edit it? i had to edit it 6 times ffs it finally worked geez. fixed most of the gmcs, but now the gas issue is here. i dont understand what he means by fixing the expo? oh and the mineral blocks are now 70 at mainbases to make rushes more practical. should i get rid of the compound and just make it REALLY open and have that one huge base for ground later on while the small bases are your air builds for early game?